Frogs of Southern Africa is the definitive interactive guide to frog identification in southern Africa and is suitable for all nature lovers, amateur 'froggers', students and professional scientists. 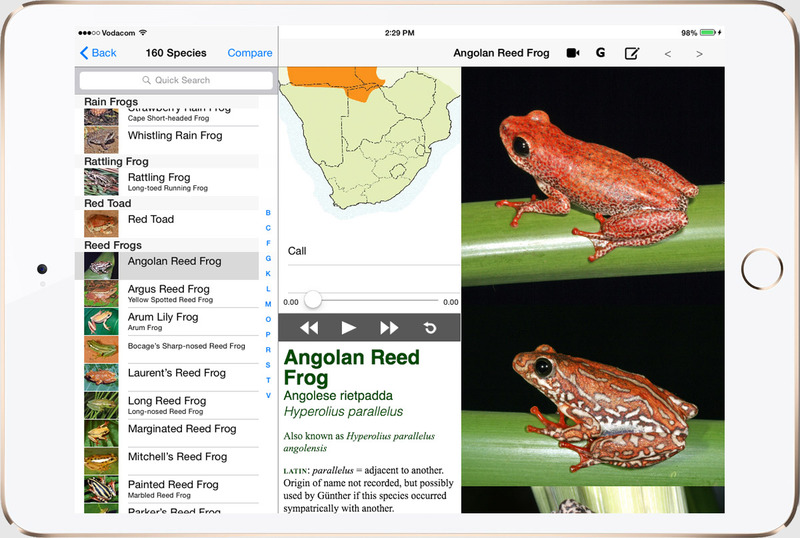 Intuitive and accessible, the app introduces the user to 160 frog species in the region. The species, with their tadpole stages, are comprehensively described, covering conservation status, calls, distribution maps, habits, habitats and key ID points. The genera are also fully described and illustrated, and a 'distinctive characters' feature provides key information at a glance. Identification is further aided by some 1400 photographs, 70 videos that record frog behaviour, and 152 calls. A Smart Search function uses four morphological characteristics, combined with distribution maps and GPS-driven location-based data, to help users narrow down their search and make a positive identification of the specimen they have found. 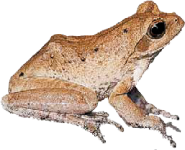 The Compare function allows users to view two different frog species side by side on the same screen, which makes it easier to distinguish between species that are similar in appearance. The app includes a Life List feature, which makes it possible for the more serious frogger to store sightings, including the date of the observation, comments and GPS location. This list can be exported to email. The app also allows users to upload their sightings and other data to an online database at the Animal Demography Unit (ADU) at the University of Cape Town, providing scientists with valuable data about the distribution and conservation status of frog species across southern Africa. Easy to use, fun and educational, this app is the definitive tool for all nature lovers, amateur froggers, students and professional scientists. A multilingual app that introduces young kids to southern Africa's frogs and toads in a colourful, informative and stimulating way.